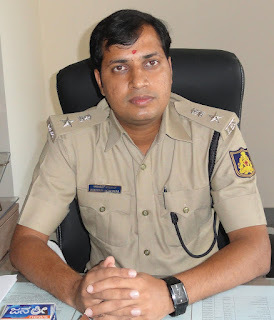 Mr.Anupam Agrawal has taken charge of new Superintendent of Police of Ramanagaram District recently. An IPS officer of Karnataka Cadre hails from Jodhpur in Rajasthan. It is learnt that he completed his B.com and Charted Accountancy. He successfully completed IPS with 103 rank. After completing his probationary as ASP at Davangere, Mr. Anupam Agrawal has been posted as SP of Ramanagaram District. An upright officer, within few days of taking charge of the office is all set to modernize the district police. As his first initiative for transparency in administration he is developing a blog of the District Police. Very soon the district police can also be seen of Facebook. Mr.Anupam Agrawal has taken charge from his predecessor Mr.S.B.Bisnalli.